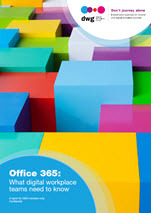 DWG’s new research “Office 365: What digital workplace teams need to know” takes a deep dive into Office 365, Microsoft’s fastest ever growing product. Microsoft is positioning Office 365 as being able to respond to key trends in the digital workplace: remote work from anywhere, bring your own device (BYOD), shrinking IT budgets, cloud collaboration, and the “do more with less” mentality. Not just focusing on SharePoint Online or the capabilities relating to the intranet, this report takes a comprehensive look at a platform which many organizations are deploying but still not exploiting to its full potential. The Office 365 report covers business drivers and benefits, challenges and risks, opportunities and critical success factors, plus the capabilities of Office 365. It also looks at leading examples of practice from DSM and dormakaba.